San Francisco's Exploratorium is taking its mission outside its walls and into the community. 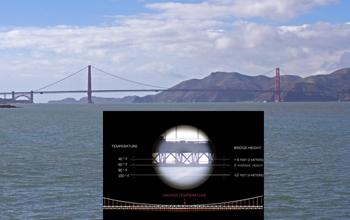 The "Outdoor Exploratorium" is a National Science Foundation-supported project that includes a collection of interactive exhibits that encourage users to notice and experiment with outdoor phenomena. The move outdoors stemmed from a simple vision: to engage people of all ages in science and help them understand their own connections to the environment. Installed at nearby Ft. Mason Center, the exhibits respond to the built and natural landscapes by incorporating everyday components of the city, from cracking pavement to wind behavior, and adding science-based twists like transforming the Golden Gate Bridge into a giant thermometer or using San Francisco fog horns in an exhibit on the speed of sound. For more information, visit http://www.exploratorium.edu/outdoor/.